Sesame chicken is our niece’s favorite thing to order from Chinese take-out. Of course, when she comes to stay with us, we avoid the take-out menus. 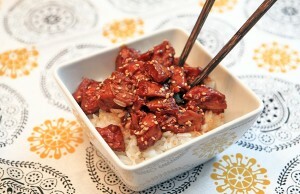 She enjoys cooking beside us, so we came up with this recipe to mimic the Asian flavors that she loves. Stir together the first five ingredients and pour 1/2 into a large Ziploc bag. Reserve the remaining marinade for later. Add the chicken breasts to marinate in the fridge for a couple of hours or overnight. Heat a large skillet over medium-high heat, add a drizzle of olive oil to pan. Add chicken to pan; cook 3 minutes on each side until browned. Add remaining marinade to the pan. Cook for 2 minutes until liquid is syrupy, stir frequently. Place rice in each bowl; top each serving with Honey Sesame Chicken. Garnish with sesame seeds. Don’t forget the chop sticks! Yummm! This looks delicious! Honey Sesame Chicken is probably one of my favorite Chinese Take-out meals too, but since we rarely get take-out anymore, I probably haven’t had it in at least a year. This is a great way to make it at home AND keep it a bit on the healthier side! Love it! Stephanie – Let us know how it turns out when you make it. We hope you love it!